Synth-Funk Musician Com Truise Opens Up About His First Studio Album in 6 Years, "Iteration"
Seth Haley’s decision to adopt the spoonerism Com Truise as his musical moniker was a “happy accident.” (For non-nerdo readers, a “spoonerism” is, according to Merriam-Webster, a “a transposition of usually initial sounds of two or more words.”) Seth was at lunch with some friends while working at an advertising agency back east. His friend said “Com Truise” by mistake (Oxford deems a spoonerism a “verbal error”) and it stuck. Seth had been making electronic music in his free time since high school, but at the time he was working on what would turn music from a hobby into a full-time job. Things took off for Seth when the taste-making label Ghostly International heard his music and signed him. Soon after, he was asked to go on tour with Glitch Mob and Phantogram. He asked his design director if his job would still be available when he returned. The design director happened to have been in a band himself before advertising, and told Seth, verbatim: “ride the wave until there’s no more wave left.” Seth put in his two weeks notice. This infuriated his parents, who were thrilled their college dropout son had finally landed a high-paying job. They eventually came around, however, about three years ago when they came to see Com Truise play a sold out show at Webster Hall. A single from Com Truise’s last album Galactic Melt (2011). 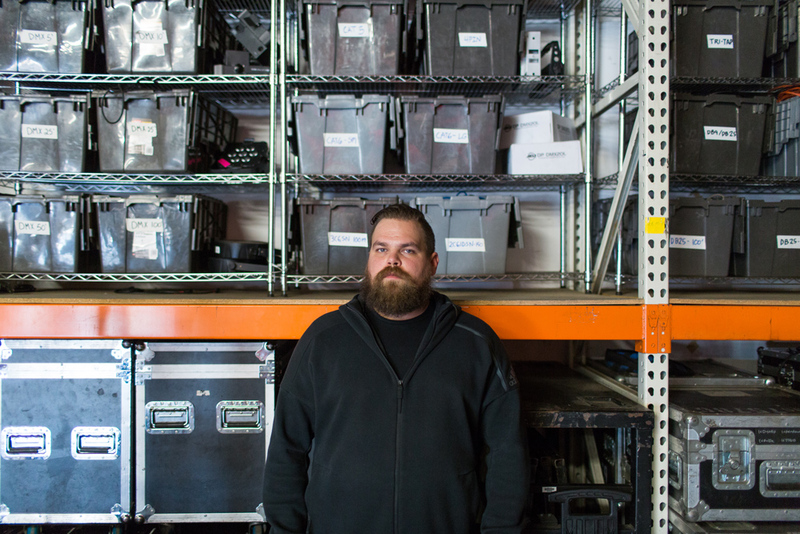 I meet the 32-year-old electronic musician in a warehouse in Alhambra where his programming team is prepping light installation for his upcoming tour. It’s Friday afternoon in late April; the Santa Ana winds are blowing so hard he can’t hear me when I yell his name. It’s not until I enter the warehouse through an open garage door, away from the fray, that I get his attention. The 40-stop tour starts in two days, on May 1st; his sophomore album Iteration drops the following month, on June 16th. Seth tells me he’s in “freakout mode,” but he looks calm. He’s wearing a black Adidas tracksuit and Adidas alphabounce sneakers with neon accents that remind me of his music, which reminds me (and everyone else) of the ‘80s—in particular, arcade machines and Italo-disco. “What drew you to the ‘80s?” I ask early in our conversation. Rather, Seth’s first love was drum and bass, which he discovered on a digital cable music station in high school. While his upstate New York classmates (Seth grew up in the “woods” of Oneida, NY) listened to grunge and rock, Seth became obsessed with Phat Boy Slim, Prodigy, Chemical Brothers, the Future Sound of London, inspiring him to start collecting equipment and make electronic music of his own. His mom at the time worked in a medical office, and Seth would ask her to bring home “biohazard” stickers for him to attach to his equipment. He laughs at himself; this is one of several times in our conversation in which he refers to himself as a nerd. I often ask musicians where they see themselves in 5-years, and they often express a willingness to be as famous as humanly possible, to make tracks with Kanye and Drake, drive Bentleys, sip Dom on red carpets and private jets. But Seth, who is currently based in LA, wants to return to upstate New York, lay down roots, and live a “quiet normal existence outside of music.” Aside from collecting music equipment and cameras, he doesn’t have much of a desire for material possessions. Rather, he wants to return to the woods and spend as much time as possible with his family. A track from 2011 release Fairlight EP. LA has had a huge influence on the sound of Iteration, which he says has “more room in it.” While he describes his earlier stuff as “compressed and squashed,” Iteration is inspired by the spacious expanse of LA. Thematically, the music explores “longing, hope, anxiety, and triumph”—it’s a continuation on his earlier work, which is about an android astronaut going to space and making contact with an alien civilization. He tells me that because his music lacks lyrics and he prefers not to pull subject matter directly from his own life (“I’m not going to write a song about a breakup”), it helped to come up with this story to give his albums an arc. He’s thought about turning the story into an actual film, which he would score, and has a friend who wants to write the screenplay with him. A track off Com Truise’s upcoming album Iteration. Com Truise is undeniably cinematic—to me, it recalls Drive, It Follows, and Stranger Things, recent visual marvels that all hark back to the ‘80s. Seth tells me he’s “had meetings” about scoring films, but nothing has come yet. His dream would be to first score a B horror film to learn how it all works, and then move on to sci-fi as he becomes more experienced. But really, he tells me, he’s open to whatever comes his way. Iteration drops June 16 on Ghostly International, but you can preorder it here. Our favorite option is the album on beautiful blue/white vinyl. Com Truise’s official merch site also has these amazing socks.